I made this salad for my dad on a night that I was cooking an all veggie dinner for me and mom. I wasn't even planning on sharing the recipe, but it turned out so pretty and my dad ate every bite so I figured it was website worthy. If you make the shrimp and balsamic reduction in advance (which you should so that they can be served cold), this salad is a super quick, throw-together meal. This meal is grain free. Add shrimp, garlic, cilantro, pepper and the juice from 1/2 a lime to a lightly greased small pan. Sauté for around 3 minutes over medium heat or until shrimp is just cooked through and opaque. Chill in the refrigerator for several hours or overnight. Add balsamic vinegar and the rest of the lime juice to a very small sauce pan. Reduce over medium/low heat until thickened but not yet syrupy. Chill in the refrigerator with the shrimp. 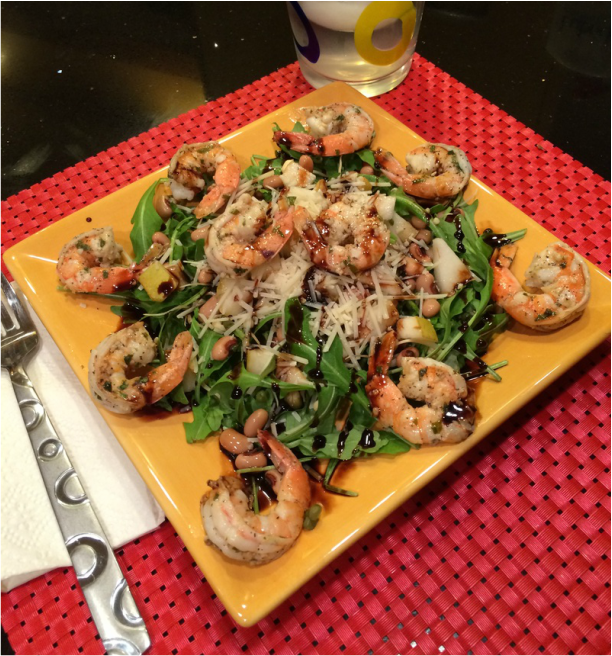 Toss or layer arugula, peas, pear, cheese and chilled shrimp. Serve with drizzled balsamic reduction. Don't know what to do with the rest of that pear? Try this Turmeric Mackerel with Carrot-Pear Shirataki Rice and Grapefruit Garnish.